Paris Smart City 2050: greenish nightmare? Archi-new - Free Dwg file Blocks Cad autocad architecture. Archi-new 3D Dwg - Free Dwg file Blocks Cad autocad architecture. 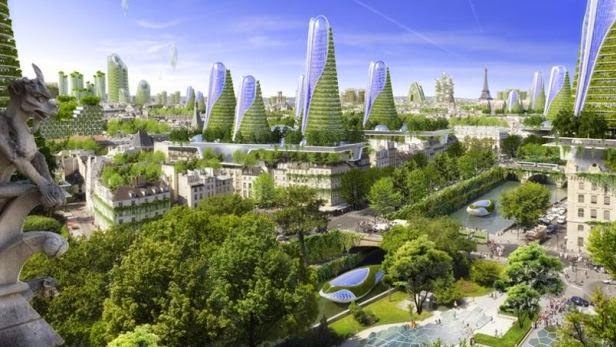  Home › news › Paris Smart City 2050: greenish nightmare? Paris Smart City 2050: greenish nightmare? Last spring, the team responded to a call for tenders for the Agency of urban ecology of the city of Paris and was selected to the floor, for 4 months, the Paris of 2050. rapid urbanization, population growing, lack of space and climate change have pushed the team in particular to stage eight prototypes of mixed towers positive energy, taking into account the future constraints of the capital. All in enrolling in the Plan Climate Energy of the City of Paris, for a 75% reduction in greenhouse gas emissions by 2050. In the near future, the capital is thus transformed into a true plant city, dedicating the golden age of big towers and green working repatriation of nature in the city. Tour Montparnasse We discover, transformed into a vertical Central Park 58 storeys providing a stepped extension Luxembourg park. Along the same lines, towers housing 120 meters high, called "Mountains Towers" are grafted on the roofs of buildings in the historic Rue de Rivoli. In the 14th arrondissement, the "anti-smog Towers" Photo-catalytic huge towers dépolluantes, serve as "ecological corridor". The team also developed two inhabited bridges the east and west gates of Paris, a gigantic vertical farm in the 19th district, as well as apartment buildings, hexagonal shaped alcoves, placed on the roof of the famous 20th HBM arrondissement. A vision easily transposed to a science fiction film directed Steven Spielberg. And yet, as the responsible architect, these projects have all been designed from existing technologies, or being studied in laboratories. On the merits, the study remains interesting. It focuses on the multiple potential of biomimicry. Or the art of inspiration from nature to innovate, develop a harmonious city and anticipate the possible forms of the habitat of tomorrow. But on its shape? Is it reasonable to consider this a responsible and sustainable approach, arming himself with a huge pot of green paint? And it's true that there are only a few seconds to look on the visual associated with this study to understand that abuse of green liquor night undeniably its credibility ... Let's be honest, this juxtaposition of environmentally remarkable tricks responsible and will never turn Paris into a sustainable city. On the one hand, it was possible to build upwards in Paris would know ... (The latest example: the utter failure of the Triangle Tower.) And secondly, it's probably a little bit lowest that we must first look. Paris lack of greenery, it is a fact, it is a highly concentrated city, but before turning to the sky, it would be nice to build sustainable roots. In recent years, similar projects futuristic plant tours have increased among architects, in a kind of pseudo Ecolabel: covered with plants, equipped with greenhouses, farms, waterfalls and other natural plants of all kinds. Each time, it's the same thing: green pixel waves splash the various 3D perspectives. It is certainly extremely soothing to the eyes, as chlorophyll is delectable to lungs. But the abuse of "Greenwashing" in such studies is highly susceptible to my sense of powering artificial ecological perceptions among the general public. In conclusion, I allow myself the parallel between Paris Smart City 2050 and the work of Belgian architect (another) Luc Schuiten on the Plant City. Halfway between science fiction and realism, drawings Schuiten combines architectural science, biological, climatic, shapes and colors, taking on the appearance of futuristic comics. While advocating similar ideas, playful and poetic style is in my opinion much less misleading, much more educational and more honest ... seeking the imagination to dream while anticipating more or less realism, the future of cities metamorphosed by the plant.